Early 20th century Pittsburgh Plate Glass Company Advertisement. 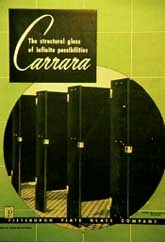 "The Structural Glass of Infinite Possibilities: Cararra." The dramatic growth and popularization of the early 20th century Art Deco, Streamline, and Moderne architectural styles were fueled, in part, by technological advances in the building materials industry. New products, such as stainless steel and plastics, enlarged the realm of architectural design. The more traditional materials, on the other hand, quickly developed fresh, innovative forms and uses. For example, the architectural glass industry became especially creative, introducing a series of new glass products known as structural glass. Used predominately for wall surfacing, these now familiar products included glass building blocks, reinforced plate glass, and pigmented structural glass. Pigmented structural glass, popularly known under such trade names as Carrara Glass, Sani Onyx (or Rox), and Vitrolite, revolutionized the business and rapidly became a favorite building material of the period's architects and designers. 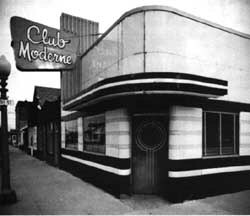 The Club Moderne, Anaconda, Montana, reflects the exceptional historic detailing associated with pigmented structural glass—polished-mirror finish, rounded corners, and horizontal polychorme bands. Photo: Jet Lowe, HAER collection, NPS. The versatility of pigmented structural glass contributed to its popularity. Not only could the material be applied to both the exterior and interior, the glass could he sculptured, cut, laminated, curved, colored, textured, and illuminated. Often applied directly over existing architecture to remodel older buildings, as well as in new construction, a veneer of pigmented structural glass had the ability to define a building's architectural character as new and up-to-date. Pigmented structural glass also complemented the period's silvery metal accents and affinity for slick, shiny surfaces. A successful application of a structural glass veneer often resulted in a streamlined look characteristic of the Art Moderne architectural style. As tastes changed and production costs rose, however, pigmented structural glass fell into disfavor and disuse by mid-20th century. With today's rekindled interest in the Art Deco, Art Moderne, and Streamline styles, the preservation and replacement of pigmented structural glass have now become an integral part of many rehabilitation projects, particularly in relation to commercial storefronts. This brief, then, was developed in order to address some of the major deterioration problems associated with pigmented structural glass and to recommend methods for maintaining, repairing, and, if necessary, replacing damaged or missing pieces of pigmented structural glass. 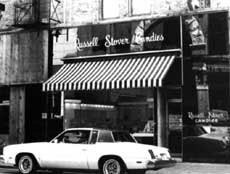 The Russell Stover Candies, Nashville, Tennessee, shows the company's historic use of deep, mirrored violet pigmented structural glass storefronts. Photo: Douglas A. Yorke, AIA. Although pigmented structural glass enjoyed widespread popularity from the beginning of the Great Depression to the outbreak of World War II, its origins can be traced to the turn of the century. In 1900, the Marietta Manufacturing Company claimed to be the first producer of pigmented structural glass, rolling the first sheet of a "substitute for marble," Sani Onyx. Penn-American Plate Glass Company quickly joined its ranks, manufacturing white and black Carrara Glass around 1906. Penn- American Plate Glass no doubt selected the name "Carrara" for the white glass's close resemblance to the white marble of the Carrara quarries of Italy. Shortly thereafter, Libby-Owens-Ford Glass began production of their own version called Vitrolite. Initially, Sani Onyx was produced for such utilitarian purposes as refrigerator linings. 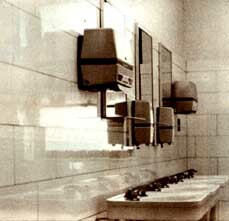 Manufacturers perceived the glass as a practical, easily cleaned, and sanitary product. Its uses, however, expanded rapidly. By the second decade of the 20th century, consumers viewed pigmented structural glass as an inexpensive substitute for marble counter tops, table tops, wainscoting, and restroom partitions. 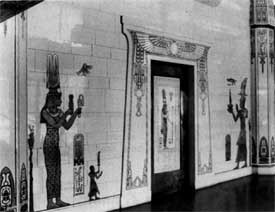 The first large-scale interior architectural application of pigmented structural glass was in the Woolworth Building (1912-1913) when Architect Cass Gilbert sheathed the restrooms with Carrara Glass. Later in the decade, the decorative possibilities of the glass received even more attention. As the century progressed, architects began to substitute pigmented structural glass for traditional building materials in new construction. Large expanses of architectural detailing such as sleek door surrounds, polished interior lobbies, and striking commercial storefronts became expected and familiar features within new, expanding downtown business districts in the 1920s and 1930s. In addition, designers quickly found pigmented structural glass to be an increasingly popular modernizing material for older and out-of-date buildings. As a result, storefronts became a favorite subject for "modernization." New Deal programs, including low-rate insured Federal Housing Administration loans in combination with a "Modernize Main Street" competition sponsored by the Architectural Record and Libby-Owens-Ford Glass, stimulated the remodeling fervor. By 1940, pigmented structural glass veneers had become synonymous with the "modern look." The numerous pigmented structural glass storefronts surviving today are testimony to the popularity of these remodelings. The extensive use of rich, black Vitrolite in this design impressed the judges of the 1935 "Modernize Main Street" competition and the architects were awarded first prize. Photo: Courtesy, The Architectural Record. The winners of the 1935 "Modernize Main Street" competition illustrated what many considered good contemporary design. The judges of the competition, including Albert Kahn, William Lescaze, and John Root, awarded architects who incorporated "simplicity," "economy," "unbroken horizontal lines," "expressed function," and "pure colors contrasting light and shadow" in their designs. Simplicity of design often translated into curvilinear recessed entries which protected consumers from inclement weather—eliminating cumbersome canvas or metal awnings—and providing additional display window space. The first and second stories of many 19th century storefronts had disappeared by 1940, hidden behind simple, yet striking, modern pigmented structural glass veneers. Although the glass was originally produced only in white, the range of colors from which architects could choose soon included black, beige, and ivory. By the 1930s, more exotic colors such as tropic green, forest green, robin blue, suntan, and jade were offered by the principal manufacturers in addition to the stock colors of gray, yellow, and tan. Agate or marbleized treatments in fanciful imitation of the "real" materials were also available. The back surface was occasionally silvered to give a rich mirror finish. Most of these colors and finishes were available in standard thicknesses from 1-1/32 inch to 1-1/4 inches. The glass's smooth exterior was obtained either by fire polishing during the normal glass fabrication process or by mechanical polishing when a high mirror finish was desired. In both cases, the smooth, slick, reflective surface made the material intensely popular with architects or designers who sought the "modern look." Although focusing on exterior applications, architects also utilized pigmented structural glass for interior spaces, replacing the porous and more expensive marble and offering a highly polished, uniform visual appearance in keeping with design trends of the 1920s and 1930s. Other uses of the material included small, high-style installations in hotels, office lobbies, bars, and lounges. Early 20th century advertisers often promoted pigmented structural glass as a new panacea of the building materials industry. Their claims were not without substance. Unlike masonry units such as terra cotta, pigmented structural glass would not warp, swell, or craze. Nor was the glass highly susceptible to staining, fading, or burning. Like most glass products, it was impervious to moisture and could be easily maintained and usually cleaned with a damp cloth. Adaptable to a wide range of uses, the glass could be colored and textured to attain brilliant visual qualities. Perhaps most important, when compared to marble, the glass was easier to handle, less expensive to use, and simpler to install. The key to proper preservation and repair of both interior and exterior pigmented structural glass is a thorough understanding of the original material specifications and detailed installation techniques. Fortunately, these specifications and techniques remain virtually unchanged from their first early 20th century application. In the installation process, hot asphaltic mastic was applied to the ribbed or textured back of each glass panel. The panel was then pressed against a masonry wall and supported by metal shelf angles which were usually bolted to the masonry substrate on 3-foot centers. The joints between the panels were filled with cork tape or joint cement. The end result was a modular veneer of clean, uniform glass panels. Essentially, the glass veneer was applied to a dry, smooth, and solid masonry or plaster-on-masonry substrate using an asphaltic masonry adhesive. Manufacturers recommended against affixing the glass directly to wood, either lath or paneling. 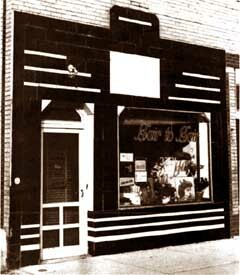 Glass thicknesses of 1-1/32 inch or 7/16 inch were most common for commercial storefronts. Shelf angles—18-gauge brass or stainless steel, 3 inch square with a 1/2 inch leg fastened directly to the masonry substrate—were used to provide additional support. Inserted along the bottom edge of the panels, they supported every second course of glass and were thus spaced not more than 3 feet apart. Horizontally, the angles were spaced approximately one every 18 inches with at least two used for any piece. Basic exterior construction details. Photo: Courtesy, Bulletin for the Association for Preservation Technology, 13 (1981). The next step in the installation procedure was to push the glass panel onto the masonry substrate. Every horizontal seam and abutment was separated by a 1/16 inch thick adhesive cork tape recessed from the front surface by 1/8 inch. Vertical edges were kept apart at a uniform 1/32 inch. In either case, the joint opening was then buttered with a joint cement which was colored to match the surrounding glass. White pigmented structural glass was used in this remodeling of the U.S. Custom House, Denver, Colorado. Photo: Gregory D. Kendrick. Proper detailing at the edges of the veneer could prolong the life of the pigmented structural glass. For example, to prevent possible chipping and cracking of the glass where it met the sidewalk, a cushion of neoprene or leather was provided and the exposed surface then caulked. The side edges of the glass were detailed in a variety of methods or the glass simply terminated at the desired location with the ends ground smooth. In either case, the edge was secured to the substrate with a mastic and the joints or void filled with joint cement or caulking compound. Where the edge of the glass abutted another material, such as the brickwork of a neighboring storefront, the glass was held back 1/8 inch to 1/4 inch from the adjacent material. The gap was usually filled with pliable caulk to permit expansion and to prevent moisture migration. Construction methods and materials were quite similar for interior and exterior uses of pigmented structural glass. Most interior veneers were the same thickness and approximate dimension of those used for exteriors. Minor differences did, however, exist. For example, joints between the pieces of glass could be reduced to little more than hairline cracks for interior applications due to the limited thermal expansion of the substrate. On the other hand, the use of glass as an indoor ceiling material created unusual installation requirements. Ceiling slabs 11/32 inch in thickness were attached to 1 inch x 4 inch wood furring strips with mastic (a full 4 inch width coverage was recommended around the edge of the panels). 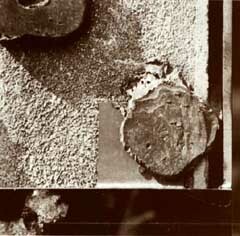 Brass wood screws and small rosettes, protected with felt exterior covers, provided additional support. As a non-veneer material, pigmented structural glass was generally used for counter and table tops and restroom partitions. Counter tops presented little or no unusual installation problems. Partitions, however, often involved formidable installation challenges; for example, enormous glass panels, weighing up to 16.25 pounds per square foot and measuring 1 inch to 1-1/4 inches in thickness were used. The desired thickness was obtained by cementing two 7/16 inch slabs together with mastic. To accommodate this heavy, yet fragile, load, a reinforced support and connection system was developed which utilized metal sleeves, iron anchors, and steel straps bolted directly into the glass panels. Owners of the Hadley Dean Glass Company Warehouse, St. Louis, preserved the unusual polychrome pigmented structural glass interior lobby. Photo: Paul Marshall. Historically, the cement joint between glass panels was intended to provide an integrated, watertight surface. Unfortunately, the traditional joint cement did not possess a long lifespan. Cracked or open joints have been the consequence, usually resulting from improper original application of the cement or from the normal thermal expansion and contraction cycle associated with weathering. Cracked or open cement joints then accelerated deterioration of the masonry substrate and/or the mastic adhesive bond by allowing water to penetrate the internal system. Water entering the system weakened the bond between the mastic and the masonry substrate or rusted the anchoring shelves. This caused the individual glass panels to gradually slip away from their original positions and fall. Failure due to long-term hardening of the original mastic adhesive has accounted for a substantial loss of pigmented structural glass panels. The petroleum-based mastics normally possessed a 30 to 40 year lifespan. Once flexibility of the adhesive is lost, the glass panels become vulnerable to slippage and eventual destruction. Glass breakage through impact is virtually impossible to prevent. The material is, by its nature, vulnerable to loss through vandalism or accident. The pigmented structural glass panel has separated and fallen, exposing the substrate and hardened, brittle daubs of mastic. Photo: Douglas A. Yorke, AIA. The maintenance of a dry masonry substrate, mastic, and metal anchors is essential to the longevity of a pigmented structural glass veneer. Thus, repointing cracked or open joints—particularly at ground level where glass abuts concrete—and caulking of slightly cracked glass panels is an ongoing concern. Where drainage to conduct water away from the wall is faulty or insufficient, the problem should be immediately corrected. For example, roof flashing, downspouts, and gutters should be repaired or new systems installed. Cracked or open cement joints, particularly in exterior applications, can present a serious preservation problem because they permit water to penetrate the internal system of a pigmented structural glass veneer. Rusting metal anchors or deteriorating mastic adhesive may be the result. Although the traditional joint cements are easily colored and may be neatly applied, they are no longer recommended for the repair of pigmented structural glass because their longevity is limited. Present-day silicone compounds, on the other hand, offer flexibility, relative impermeability to moisture, ease of installation, and a long lifespan. The proper color match can be obtained by mixing the compound with tinted polyester resins. Any glass panel that can be repaired should not be replaced. Thus, the decision to repair or replace damaged historic pigmented structural glass panels always needs to be made on a case-by-case basis. In many instances, the damage may be so minor or the likelihood of finding suitable replacement glass panels so small that repairing, reanchoring, and/or stabilizing the damaged glass is the only prudent choice. A slightly chipped or cracked pigmented structural glass panel left unrepaired will inevitably become a source of water infiltration. Careful patching of those cracks with an appropriately colored, flexible caulk will deter moisture penetration while still allowing expansion and contraction with temperature fluctuations. Although patching is by no means a permanent solution, it will help to protect the material from further damage due to the effects of weather. 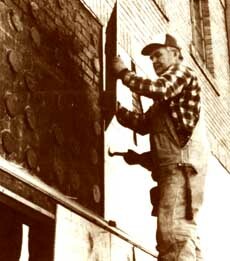 A worker carefully removes a large glass panel by placing a small piece of wood between a flat prying bar and the glass, then exerting steady pressure. The majority of panels were removed without damage using this procedure. Photo: Thomas Keohan. Removal of existing glass panels from a wall in order to re-apply mastic adhesive that is failing or to replace broken panels (see also paragraphs on "Replacement of Damaged/Missing Glass Panels") is an exacting operation because the mastic used to attach the glass panels to the wall may have become hard and extremely difficult to separate from the ribbed backing of the glass. Fortunately, commercial solvents may be purchased which are capable of softening the hardened mastic, such as methyl ethyl ketone, methyl isobutyl ketone, and acetone. These solvents may be introduced into the cavity behind the glass with a crook-necked polyethylene laboratory squeeze bottle or a large syringe without a needle. (Solvents should be stored in fire-safe metal containers until used and should also be handled with extreme care so that they do not come into contact with the skin.) Such methods make it easy to direct the solvent into the narrow separation between the glass panel and the wall with a minimum of waste and effort. After the mastic has softened, two people using a taut piano wire sawing down from the top can safely and efficiently separate the glass from the wall. If time is a concern, a fast, simple removal method is to carefully pry the panels off with a broad flat tool such as a nail puller. A small piece of wood placed between the flat tool and glass will minimize splintering of the edges. Stubborn pieces can be removed by squirting the mastic with a solvent (as described above), then letting it set several minutes. This procedure softens the mastic, making it more pliable. The piano wire/sawing method may be useful in removing the topmost glass panels of a continuous face where no edges occur. The wire can be effectively worked into the joints and will cut through the mastic. With care, a high percentage of the glass panels can be salvaged using this method. Owners of this small barber shop, Denver, Colorado, have successfully preserved the historic character of their pigmented structural glass storefront by patching the cracked panels with a dark caulking compound. Photo: Gregory D. Kendrick. Another method of removing glass panels that has proven to be effective if the solvent-and-wire method cannot be used, involves directing steam at the face of the panel in order to soften the mastic. Although this method can be time-consuming, averaging up to 10 minutes per panel, the glass can be successfully removed. Remaining mastic may then be removed by directing additional steam on the panel, soaking the panels in hot water to further soften the mastic—or applying appropriate chemical solvents—and scraping off the softened mastic. Due to an accumulation of soot behind the glass, the surface of the masonry substrate usually needs to be cleaned before panels or a wall of pigmented structural glass are reinstalled. After removal of the glass panels has been completed, the substrate should be cleaned using a mild detergent and water, then allowing sufficient time for it to dry. The old glass must also be thoroughly cleaned of soot, grease, or old mastic that would impair bonding of the new adhesive. A mild solution of water and household ammonia will generally clean the surface adequately. The glass may then be reinstalled following a system established during removal. In reinstalling the glass panels (or new panels to replace any historic glass that has been broken), it is recommended that the mastic adhesive used throughout the 1930s and 1940s be used, because it is still the best bonding material. Although modern silicone compounds offer workability, adhesion, and flexibility, they tend to be expensive when used in the necessary quantity. On the other hand, butyl adhesives do not provide sufficient adhesion on nonporous materials such as pigmented structural glass. Polysulfide-based, synthetic rubber sealants do not have the short set-up time of the traditional hot-melt asphalt mastic and thus present installation difficulties. Finally, epoxies do not appear to have the plasticity essential for longevity of a glass veneer. Production of pigmented structural glass in the United States ceased several years ago, and only in rare cases have inventories been discovered. Yet, checking all the obvious and not so obvious sources for replacement may prove to be rewarding. Occasionally, long established "jobbers" will have a limited supply of pigmented structural glass. It is not uncommon for glass contractors to buy entire stocks of glass when companies or supply houses go out of business and to use this original material to make repairs on historic buildings. Locating a source for new glass similar to the historic pigmented structural glass is as much of a problem as finding the original glass. Until about 10 years ago, glass companies near Bavaria in Western Germany were producing a pigmented structural glass called "Detopak." At present, these factories appear to be the only suppliers in the world. The glass is made in small batches, and the color can vary due to the lack of modern mechanization in the pigmenting process. For this reason, American importers generally only deal in white and black glass. If a satisfactory replacement panel cannot be located, one alternative is to remove a piece of glass from an inconspicuous part of the building and position it on the more prominent facade. Modern spandrel glass, a new substitute material described below, may be considered as a replacement for the less visible area. If replacement glass cannot be found to replace broken or missing panels, a compatible substitute material may be considered if it conveys the same visual appearance as the historic material, i.e., color, size, and reflectivity. Two of the historic producers of pigmented structural glass now manufacture a similar product known generically as "spandrel glass" and marketed under the trade names of Spandrelite and Vitrolux. This heavy plate glass has a ceramic frit or colored ceramic surface fired to the back of the glass. Stock colors are available in a range of grays, browns, bronzes, and black. Custom colors are also available. A second option simulates the appearance of pigmented structural glass by spraying paint, carefully tinted to match the historic glass, onto the back of plate glass. However, the paint may fade over a long period of time and thus require periodic reapplication. Sheet plastics may also be used and are available in a range of colors, sizes, and thicknesses. These materials are more suitable for interior applications, however, where the negative effects of ultra-violet light are lessened. The preservation of pigmented structural glass remains more a materials issue than a detailing problem. The glass panels were and are extremely susceptible to breakage due to accident or vandalism. In addition, many of the historic installation materials such as the mastic adhesive and joint cement did not possess a long lifespan. Periodic maintenance, inspection, careful repair, and selective replacement—in like kind—are essential for the longevity of any historic pigmented structural glass veneer. Even though the architectural glass industry has continued to expand its production of different types of glazing, the imaginative innovations of Carrara Glass, Sani Onyx, and Vitrolite in the early part of this century have not been surpassed. New technology, combined with human artistry, produced exteriors and interiors alive with color and dimension. Glittering movie palaces, sparkling restaurants, and streamlined storefronts as well as the more mundane kitchens, restrooms, and laboratories exemplified the extensive variety and potential of pigmented structural glass. Carrara Glass, Sani Onyx, and Vitrolite were integrally linked to the architecture and interior design of the 1930s and 1940s and helped to define what was "modern." Thus, every effort should be made to preserve this significant historic material in both the innovative buildings of the Art Deco, Streamline, and Moderne styles as well as the "modernization" of earlier structures. This Preservation Brief is partially adapted from an article entitled "Material Conservation for the Twentieth Century: The Case for Structural Glass," written by Douglas A. Yorke, Jr., AIA, which appeared in the Bulletin for the Association for Preservation Technology, 13 (1981), and from an unpublished manuscript by Thomas L. Hensley of the National Park Service. Preservation Brief 12 was edited by Gregory D. Kendrick, Historian, under the technical editorship of de Teel Patterson Tiller, both of the Rocky Mountain Regional Office, National Park Service. We wish to thank Mr. Yorke for permission to use his article and photographic material. Finally, we want to acknowledge Thomas G. Keohan, Field Representative, Mountains, Plains Regional Office, National Trust for Historic Preservation for donating photographs and assistance to this project. Gay, Charles Merick and Parker, Harry. Materials and Methods of Architectural Construction. New York: John Wiley and Sons, Inc., 1931. Glass, Paints, Varnishes and Brushes: Their History, Manufacture and Use. New York: Pittsburgh Plate Glass Company, 1923. Hornbostel, Caleb. Construction Materials. New York: John Wiley and Sons, Inc., 1978. Kidder, Frank E. and Parker, Harry. The Architect's and Builder's Handbook, 15th ed., New York: John Wiley and Sons Inc., 1913. McGrath, Raymond and Frost, A.C. Glass in Architecture and Decoration. London: The Architectural Press, 1937. "Modernize Main Street." Architectural Record 78 (October 1935): 209-266. Ramsey, Charles George and Sleeper, Harold Reeves. Architectural Graphic Standards. 3rd ed., New York: John Wiley and Sons, Inc., 1941. Richey, H. G. Richey's Reference Handbook for Builders, Architects and Construction Engineers. New York: Simmons-Boardman Publishing Corporation, 1951. The Secretary of the Interior's Standards for Rehabilitation and Guidelines for Rehabilitating Historic Buildings (Revised 1983). Washington, D.C.: Technical Preservation Services Division, U.S. Department of the Interior. Standard Building Code. Birmingham, Alabama: Southern Building Code Congress International, Inc., 1979. Sweet's Architectural Catalogue, 22nd annual ed., New York: F.W. Dodge Corporation, Sweet's Catalogue Service, 1927—1928; Section B, pp. 1406-1409, (Vitrolite product literature). Sweet's Indexed Catalogue of Building Construction. New York: Architectural Record Company, 1906. Time Saver Standards, 1st ed., New York: Architectural Record, 1946. Yorke, Douglas A. Jr., AIA. "Materials Conservation for the Twentieth Century: The Case for Structural Glass." APT 13 (1981): 19-30.